Research background: The Central Bank of Sweden declared in years 1999–2006 the implementation of the Svensson’s concept of inflation forecast targeting (IFT). It means that the repo rate decision-making process depends on the inflation fore-casts. The concept evolved from the strict IFT with the decision-making algorithm called ‘the rule of thumb’ to the flexible IFT. Purpose of the article: The aim of the article is to: (1) analyze the influence of the inflation rate and GDP growth rate on the repo rate decisions, (2) analyze the influence of the inflation rate and GDP growth rate forecasts (in two year horizon) on the repo rate decisions in Sweden in years 1999–2006. Methods: The analysis encompasses the repo rates decisions, CPI inflation rate, GDP growth rate, central paths of CPI inflation forecasts and central paths of GDP growth rate forecasts (the mode values) in the two years horizon published by The Central Bank of Sweden in years 1999–2006. The studies are based on the Taylor-type instrument rule and forecast-based Taylor-type instrument rule. The methodology used is multiple linear regression models. Findings & Value added: The Central Bank of Sweden in years 1999–2006 implemented direct inflation forecast targeting (DIFT) rule. The decision-making algorithm was based on the CPI inflation forecasts and the rule of the thumb algorithm. The exact rule of the thumb was as follow: if the inflation forecast, in the two year forecast’s horizon exceeded the infla-tion target by 1 p.p., then the central bank raised the repo rate by 0.4 p.p; if it was below it, then the central bank reduced the repo rate by 0.4 p.p. If the inflation forecast was equal to the inflation target, then the repo rate remained unchanged. The historical repo rates differ from the theoretical estimated rule of the thumb’s repo rates by +/-0.28 p.p. Adolfson, M., Laseen, S., Linde, J., & Villani, M. (2007a). Bayesian estimation of an open economy DSGE model with incomplete pass-through. Journal of International Economics, 72(2). doi: 10.1016/j.jinteco.2007.01.003. Adolfson, M., Laseen, S., Linde, J., & Villani, M. (2007b). RAMSES- a new general equilibrium model for monetary policy analysis. Economic Review, Sveriges Riksbank, 2. Batini, N., & Nelson, E. (2001). Optimal horizons for inflation targeting. Journal of Economic Dynamics and Control, 25(6-7). doi: 10.1016/S0165-1889(00)00060-9. Clarida, R., Gali, J., & Gertler, M. (2000). Monetary policy rules and macroeconomic Stability: evidence and some theory. 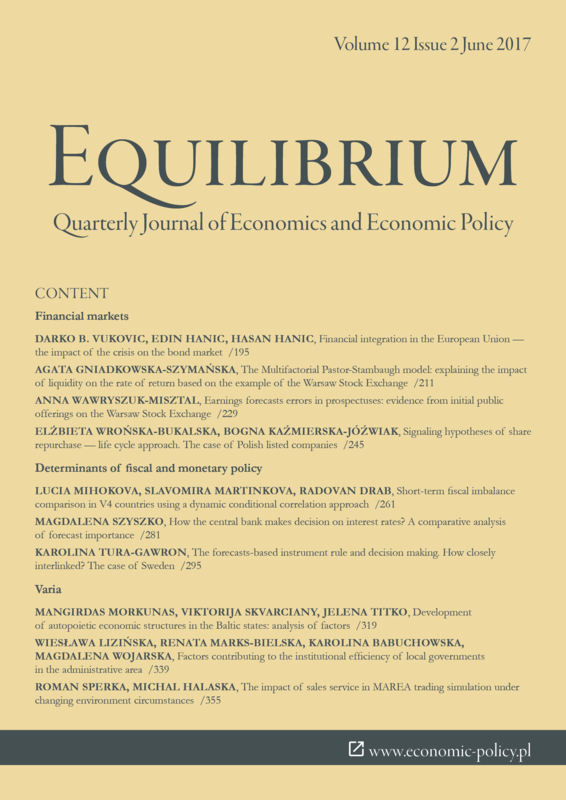 Quarterly Journal of Economics, 115(1). doi: 10.1162/003355300554692. de Brouwer, G., & Ellis, L. (1998). Forward-looking behaviour and credibility: some evidence and implications for policy. Reserve Bank of Australia Research Discussion Paper, 9803. Heikensten, L. (2000). Monetary policy and wage formation. Speech at the Office of Labour Market Policy Evaluation (IFAU). Stockholm.05.05.2000. Heikensten, L. (2003). Monetary policy and potential growth. Speech at the Swedish Economics Association, Stockholm, 28.03.2003. Levin. A, Wieland, V., & Williams, J. C. (2003). The performance of forecast-based monetary policy rules under model uncertainty. American Economic Review, 93(3). doi: 10.1257/000282803322157016. McCallum, B., & Nelson, E. (2005). Targeting vs. instrument rules for monetary policy. Federal Reserve Bank of St. Louis Review, 87(5). Orphanides, A. (2001). Monetary policy rules based on real-time data. American Economic Review, 91(4). doi: 10.1257/aer.91.4.964. Orphanides, A. (2003). Historical monetary policy analysis and Taylor rule. Journal of Monetary Economics, 50. doi: 10.1016/S0304-3932(03)00065-5. Rosenberg, I. (2006). The Riksbank’s inflation targeting policy – the significance of the new interest rate assumption. Speech at Swedbank markets, Stockholm, 19.04.2006. Svensson, L. E. O., & Rudebush, G. (1999). Policy rules for inflation targeting. In J. T. Taylor (Ed.). Monetary policy rules. Chicago: University of Chicago Press. Svensson, L. E. O. (2002). Inflation targeting: Should it be modeled as an instrument rule or a targeting rule?. European Economic Review, 46(4-5). doi: 10.1016/S0014-2921(01)00212-4. Svensson, L. E. O. (2003). What is wrong with Taylor rules? Using judgement monetary policy through targeting rules. Journal of Economic Literature, 41(2). doi: 10.1257/002205103765762734. Svensson, L. E. O. (2005a). Monetary policy with judgment: forecast targeting. International Journal of Central Banking, 1(1). Svensson, L. E. O., & Tetlow, R. (2005b). Optimal policy projections. International Journal of Central Banking, 1(3). doi: 10.2139/ssrn.813284. Svensson, L. E. O. (2009). Flexible inflation targeting – lessons from the financial crisis. Speech at the workshop: Towards a new framework for monetary policy? Lessons from the crisis. Netherlands Bank. Amsterdam. 21 September. Svensson, L. E. O. (2015). Forward guidance. International Journal of Central Banking, 11(4). doi: 10.3386/w20796. Szyszko, M. (2017). Central bank’s inflation forecasts and expectations. A comparative analysis. Pargue Economic Papers. 26(3). doi: 10.18267/j.pep.614. Taylor, J. B. (1993). Discretion versus policy rules in practice. Carnegie-Rochester Conference Series on Public Policy, 39. doi: 10.1016/0167-2231(93)90009-L.
Taylor, J. B. (1999). Introduction. In J. T. Taylor (Ed.). Monetary policy rules. Chicago: University of Chicago Press. Tura, K. (2015). Central banks’ inflation projections. On the edge of technical and strategical approach. Warszaw: Difin.